Quilt, Knit, Run, Sew: Five Pies, one mess! I love when I can do things efficiently. My sister brought me up a big bag of apples last week. So yesterday hubby and I decided we would make pies. 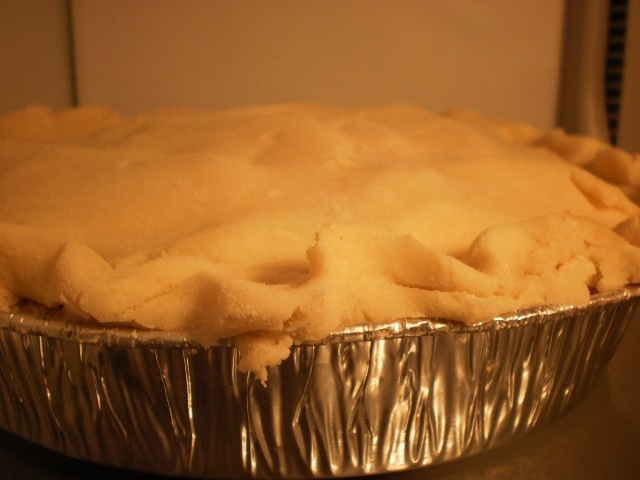 We walked to the local dollar store and bought some foil deep dish pie plates and then made sure we had big ziplock bags and enough sugar and ingredients to make pie dough..
After breakfast, the peeling and coring began. 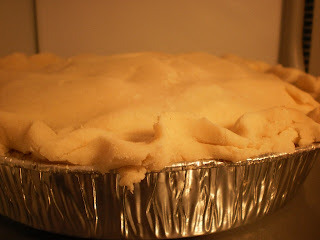 While hubby peeled, I made 5 batches of my pie dough. After 1 hour flat, we had 5 deep dish pies made and only one mess to clean up. We couldn't help it, we decided to cook one after reading on the Internet that fresh frozen apple pies should be used up within two months. No explanation as to why. Oh well, one down, four to go!! Looks so good. Cheddar cheese too? Any left for the Harringtons? 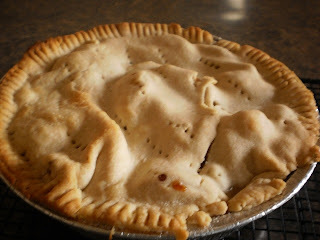 I love the look of that apple pie... yum.. haven't had an apple pie in ages..
Do you need/want more apples? I think that if DP brings more apples...you and Mert could make a pie for next time you host the FRIDAY GIRLS! Pie is my favourite (my mouth is watering) so wouldn't that be a delicious idea? ?